In our March report we look at whether the production floater forecast we made last October continues to be realistic, given developments over the past six months. There has been a slight slowing of projected global economic growth, a fall in oil prices on the spot and futures market and further evidence that shale investment is crowding out deepwater project starts. Petrobras has also not been consummating FPSO contracts as expected. The impact of these developments on expected production floater orders through 2023 is discussed -- and we provide a list of 75 FPSO and FPU projects considered to be the strongest candidates to reach the contracting stage within the next five years. 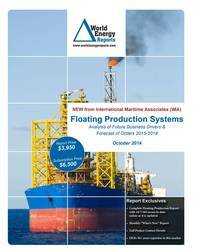 In the data section of the report are details for 217 floater projects in the planning stage, 46 production or storage floaters now on order, 303 floating production units currently in service and 31 production floaters available for redeployment contracts. Charts in the report update the location where floating production and storage systems are being planned, operating and under construction. Accompanying excel spreadsheets provide the report data in sortable format. Information is current as of 21 March.